As I continue my quest to help aspiring people of all ages become a bartender, a few months ago I had the idea to use my bar as a sort of tool for field training for battle. Though I don't really bartend much anymore, I do jump back there once in awhile to help out or if they are in need, so I have since volunteered here and there in order to get some footage of real bartending in a busy environment in the hopes that you, the aspiring bartender, might learn some valuable tricks, tips and ideas that will help you become a bartender faster. This video is first of three I have coming out. I will post the other two in the next few days. If you're itchy and impatient as a chimpanzee with rabid lice, you can click here at anytime to go to my Youtube channel to find the other two trainings. 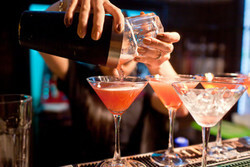 In addition, if you feel like you're ready to take that leap and start your path on becoming a bartender so you can start making big cash, you can click here to check out TheRealBarCourse, which is my uncommon and exclusive online bartending course for helping people like you become a bartender even if you have no experience. You'll need to see if course registration is open at this time though, as we open it for a few days every few weeks to stagger the enrollment so I don't get too overwhelmed and so I can be available to help my students with questions. While watching these videos, understand that there are so many different styles, themes and standards out there when it comes to bars. It's not like running a law firm, where rules and regulations are pretty much standard for each division. And though there are certainly rules and standards for bartending, ever bar and every bartender has their own style and their own rules, so use these lessons to better your knowledge, but also know that here is no ONE way to do things behind the bar, and that's what makes bartending so great. The creativity and individualism you can bring to your bar. Like being an artist. That gets people drunk. With their awesome "art supplies".